It’s hard to build a new superhero universe that can compete with the rich history of DC and Marvel, but in the pages of Black Hammer, writer Jeff Lemire and artist Dean Ormston create a compelling, sprawling superhero world by taking elements of the genre’s past and reinterpreting them in a complex story rooted in deeply personal conflict. The creative team focuses on emotion over spectacle, and the series has deep roots in both mystery and horror, examining how a group of former superheroes copes with being trapped in a rural town they cannot escape. They’re forced to live ordinary lives, but the memories of their extraordinary pasts complicate everything and intensify the tragedy of their current predicament. 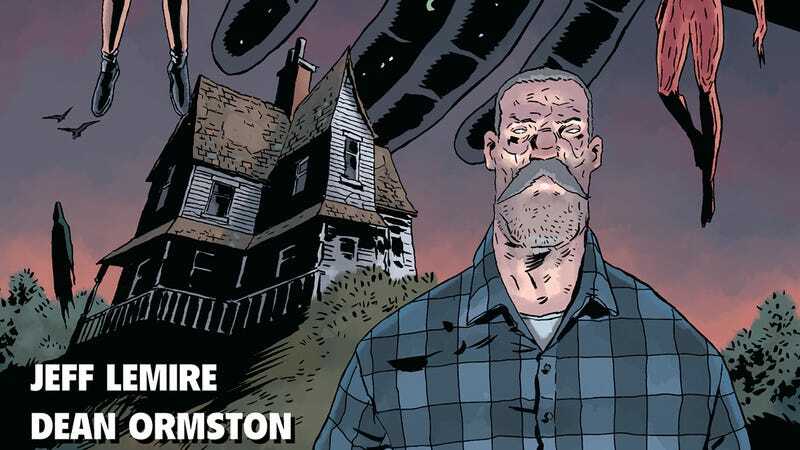 That appreciation is reciprocated by Ormston, who is especially grateful for Lemire’s support after he suffered a cerebral hemorrhage in March of 2015, a medical emergency that affected the entire right side of his body and forced the debut of Black Hammer to be delayed by a year. “I was very honored when Jeff asked me if I’d be interested in collaborating with him, but now he’s just my hero and friend,” says Ormston. “He stood by me when I couldn’t work for over six months, even though the book would be delayed for at least a year. It wasn’t even clear if I would ever be able to draw again, so I would have completely understood if he needed to use another artist, but he stood by me, and I will never forget that.” That personal relationship between the two collaborators has resulted in exceptional creative results, and readers can discover the next phase of this partnership when Black Hammer: Age Of Doom #1 goes on sale April 18.